ZnGlyThr is a peptide-based MOF (metal organic framework) with the chemical formula [Zn(GlyThr)2], made from Zn2+ and glycylthreonine . 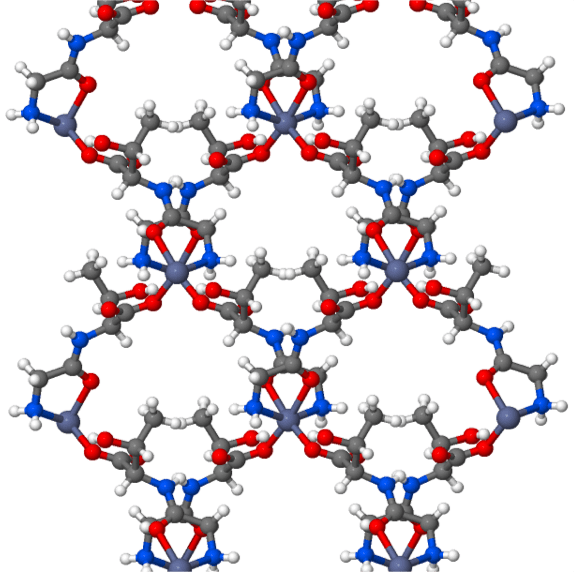 Each Zn2+ is bonded to four dipeptide molecules with a distorted octahedral geometry. Two of the dipeptide molecules form a . This is a 2D layered framework with (green dashed lines). It is a rigid framework with very small structural changes when solvent is removed, unlike ZnGlySer.